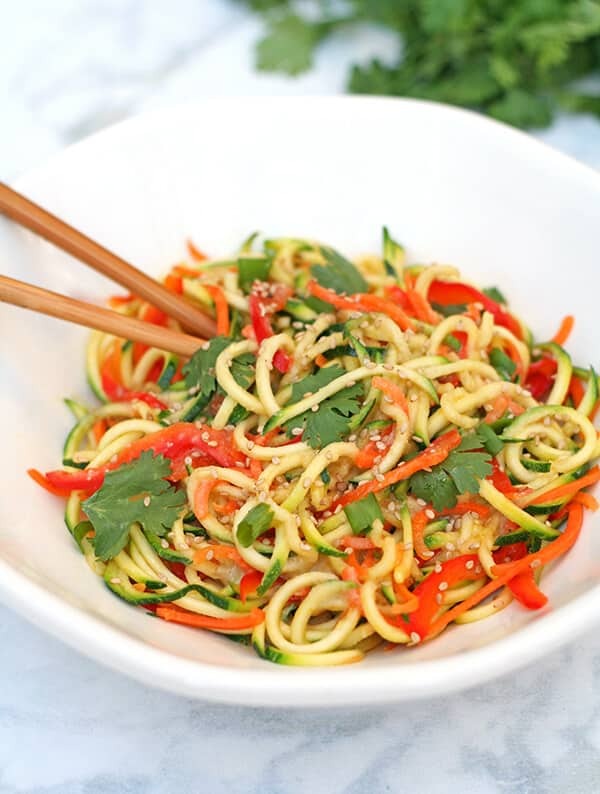 Summery, light, healthy & delicious Miso Zucchini Noodles (zoodles!). Ready from start to finish in under 15 minutes & no cooking required! Today I would like to introduce you guys to the lovely Mary Ellen from VNutrition. 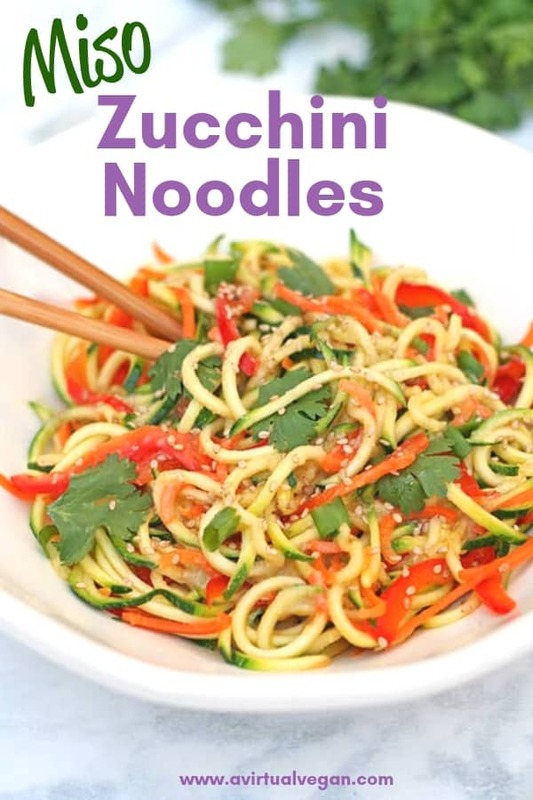 She has kindly offered to step in for me while I am on vacation and she is sharing this wonderful Miso Zucchini Noodles recipe. It looks so fresh and delicious and will definitely be on my menu when I get back in the kitchen. Be sure to show her some love by checking out her site and social media. There are links to all of these at the end of this post. 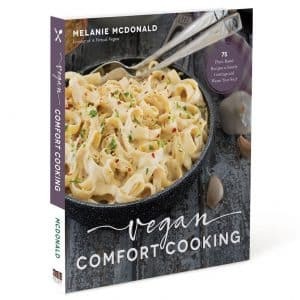 I am so honored to be doing a guest post for A Virtual Vegan as I’ve been reading Mel’s amazing blog for a while and love her creative, delicious recipes! Thanks so much for having me Mel! For my post I wanted to do something very summery and nothing is as summery to me as zucchini noodles (aka zoodles). They’re a great alternative to regular pasta during hot weather as they are light and refreshing. Zucchini noodles are not as heavy and won’t give you that same tired feeling like you might get with pasta. You’ll be good to go and enjoy your day after having a big ol’ bowl of zoodles (instead of falling asleep). If you’ve never made vegetable noodles before, you can check out my post about it but basically all you need is a spiralizer and some veggies. I thought the spiralizer might be hard to use but honestly it’s really easy once you do it the first time. Just about any type of sauce works well with zucchini noodles but I’ve been really enjoying my miso sauce lately and wanted to share that with you. Feel free to use any white miso for the sauce, however, I always use organic to make sure that the soybeans used are non-GMO. I hope you enjoy my Miso Zucchini Noodles! I’ve been eating them so much lately I think I might turn into them (as my Nana used to say when I ate the same things daily as a child). Come on over and visit me at VNutrition for more healthy veg-based food and nutrition. I also co-host a linkup called Healthy Vegan Fridays every week if you have a vegan recipe you’d like to share. I’d love to see what you’re cooking up! 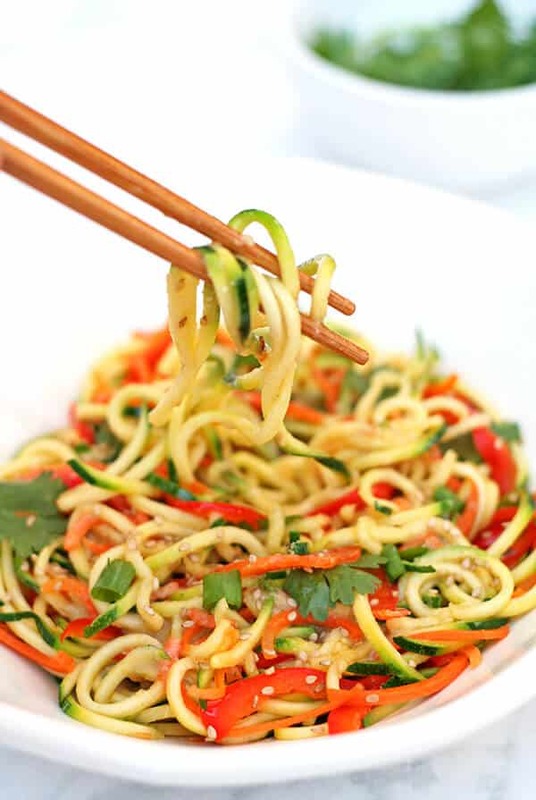 Summery, light, healthy & delicious Miso Zucchini Noodles. Ready from start to finish in under 15 minutes & no cooking required! 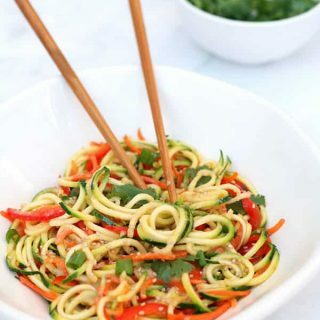 Add zoodles, carrots, and pepper to a large bowl. Add all sauce ingredients to a blender and blend until smooth. Pour about ½ or more of the sauce over zoodles (depending on your sauciness tastes)* and mix. Top with sesame seeds and cilantro to serve. * You’ll have some sauce left over but it will keep in the fridge for up to 5 days. I’ve used it as a dressing or to top more zoodles that week! 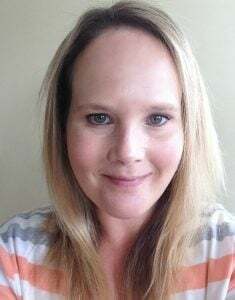 Mary Ellen is the blogger behind VNutrition, a resource for those interested in forming better nutritional habits by adopting a vegan lifestyle. She’s an animal lover, runner, and sparkle addict, who lives by the motto “Eat Kind, Be Healthy.” When she isn’t studying for her nutrition degree, blogging, or creating scrumptious vegan treats, Mary Ellen can be found doting on her shih tzus or traveling the world with her husband. Thanks for this recipe. I don’t use oil so I substituted tahini and it came out great. So pleased you enjoyed it Colleen! Oh, Mary Ellen, fun! This dish looks so good. I’ve been obsessed with my spiralizer lately, so this is perfect to feed my addiction! It is such a fun dish. Whoever invented spiralizers is awesome! What a great recipe! I wish I had all the ingredients so I could whip this up right away. Going to be trying this out soon. Thanks! These look great! I love any chance to use my spiralizer. What a wonderful summer salad. So pretty with the orange and green “noodles’ and the miso sauce sounds especially delicious! I think this would actually make a really good potluck dish. Hope you are enjoying your vacation Mel. Thanks for sharing your recipe Mary Ellen! I agree. It’s a wonderful summer recipe. I am looking forward to trying it. After all the cocktails I have been consuming this past week or so I will need a few meals like this to get me back on track when I get home! Looks delicious and I just happen to have all of the ingredients! Trying this today or tomorrow…thanks for the recipe! What a great simple summer recipe! I need to try this! Thanks Julie. 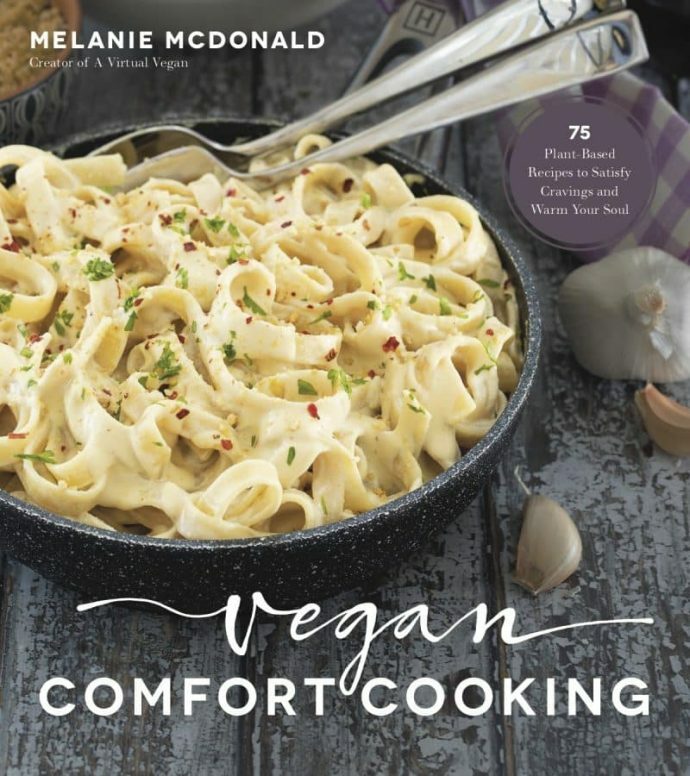 It is perfect for the warmer summer months! Thanks so much for having me Mel!